In this edition, we are happy to present a well-traveled writer and traveling mom blogger – Shweta Ganesh Kumar. 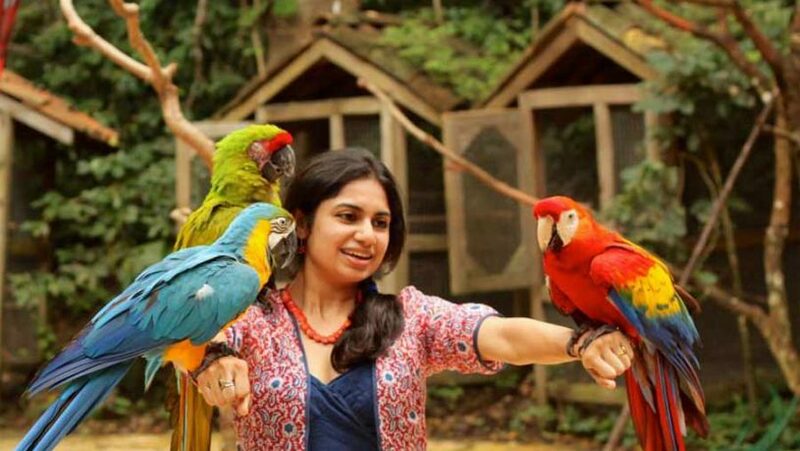 Shweta Ganesh Kumar is a writer and travel columnist. An alumnus of the Symbiosis Institute of Mass Communication, she worked as Communications Officer for Greenpeace India and as a correspondent with CNN-IBN, before dedicating her life to writing. She is currently working on her fourth book and first collection of short stories, ‘Suspended Animation – Short Stories of those who wait’. Shweta is the bestselling author of ‘Coming Up On The Show… The Travails of a news trainee’, her debut novel that sold more than 10,000 copies within the first two months of its release in May 2011 and was also listed on multiple bestseller lists. She also authored ‘Between The Headlines’ as well as ‘A Newlywed’s Adventures in Married Land’, novels that have been getting rave reviews from readers, book bloggers and critics. ‘A Newlywed’s Adventures in Married Land,’ a modern take on Alice In Wonderland has also been consistently ranked high in Amazon India’s 100 bestsellers in Indian writing list. Her short fiction and poetry has been published in Indian Voices- an anthology, Shades of Love (An Anthology of Short Stories), Winds of Change (An Anthology), Australian Women Online, Single Solitary Thought, Pothiz, Damazine, the Asia Writes Project, Bricolage Magazine, Synaesthesia Magazine, Writers Asylum and other literary magazines in more than four continents. Her monthly column, ‘Trippin With Shweta’ is a steady feature in the Indian magazine, ‘Travel and Flavours’. The New Indian Express, One Philippines and Geo (Indian edition), Venture (Indonesia) have published many of her travel columns. Her non-fiction pieces have been featured in Chicken Soup for the Indian Spiritual Soul, Chicken Soup for the Indian Soul – On Friendship and also in CBW’s India’s Top 42 Weekend Getaways eBook. Women’s Web has featured her feminist columns and RobinAge, a leading children’s newspaper featured her pet and travel columns. ‘Kiski Kahani – The Ramayana Project’, an Open Space initiative, featured her essays on the diversity of the Ramayana. She currently lives in The Philippines, with her husband, daughter, and son. She is also the Founder-Editor of The Times Of Amma – an online community dedicated to inspiring mothers one day at a time. How did you begin your journey as a travel writer? I began my journey as a travel writer in mid-2009 after I moved to the Philippines. While I had always loved travel, I had never been able to write or report about my experiences in my old job as a correspondent for a TV news channel in India. The move to the Philippines also brought with it a chance for exploring the country and South East Asia and these explorations resulted in photographs that I shared on social media. A friend who worked for the New Indian Express saw these and asked me to send in columns for the newspaper that was well received. And that’s how my journey began. Since then, my travelogues have been featured in One Philippines, Geo (Indian edition), Harrier Magazine and Venture (Indonesia). I’ve also written travel columns for children in Robin Age, a leading children’s newspaper. My travelogues were featured in Chillibreeze’s- India’s Top 42 Weekend Getaways eBook in association with India Today – Travel Plus. One thing led to another and I was invited to do a monthly column for Travel and Flavours (DC Books) called Trippin With Shweta. What are different countries/places you have visited so far? Share your experience of a memorable trip? It’s a decently long list. Oman, Philippines, Cambodia, Malaysia, Thailand, China, Indonesia, Singapore, El Salvador, USA, Honduras, Nicaragua, Cuba, Burma, Vietnam apart from most of South India, Goa, Maharashtra, and Delhi in India. Asking me to list my most memorable trip is like asking a bookworm to list her favourite books – It is just too hard to narrow it down. Yet, if one holds a gun to my head, I’d have to say my favourite destination in South East Asia is Siam Reap for the Angkor temple complex and the people. I also love Havana, Cuba for the culture, the people, the food and the vibe of authenticity that envelops the city. What are the biggest challenges that you face while you are on the road? I also face the challenge of restrooms equipped with changing tables for babies. But apart from that, I don’t really think of travel as challenging, as even the so-called challenges become part of the memories that one associates with that particular destination. Who are your favourite travel authors/writers and your favourite travel book? I love Pico Iyer’s style. But my favourite travel book is ‘The City of Djinns’ by William Dalrymple. I also adore ‘Burma Chronicles’ by Guy Delisle. What is your idea of an Offbeat Holiday? My idea of an offbeat holiday is immersive, with a lot of sustainable authentic local experiences and steering clear of branded hotels and franchises. This means staying in homestays, boutique hotels, and travelers hostels as opposed to hotel chains and franchises. It is about getting out of your comfort zone and experiencing cuisines and sights that you normally would not get to go on a guided tour. Any offbeat travel destination or experience that you have liked and would recommend to our readers? Do you self-drive on a holiday in India? Do you think self-drive holidays concept in India is gaining popularity? Yes, absolutely. There is something about charting your course and driving yourself to your destination. For most times it is not even about the destination but about the journey – the journey to learn, love, live and be grateful that you get the opportunity to do so. I do believe more and more Indian travelers are now breaking out of the planned tour circuit and starting to self-drive on their holidays. What attracts you to visit a particular place – history, popularity awe factor or something else? It is usually a combination of most of the factors you have mentioned. I love history and world heritage sites. I also enjoy places that are off the grid. What is the most difficult part of being a travel writer? Travel writing is an extremely competitive field and it is hard to break through and get published. It is also essential to get good photographs to go with your story. Sometimes, you are unable to include excellent experiences as there are no photographs to support the story and this is challenging. How is travel writers life in the Philippines? The Philippines is a great place to be based out of, as a travel writer. It has stunning islands and is also well connected to the rest of South East Asia, making it easy to travel. How do you juggle life as a mother of two and a career as a travel writer? I only travel with my family and despite the challenges of traveling with young children, I love the fresh perspective it brings to the travel. When traveling with children we tend to observe more closely, as our jaded traveler’s eyes now try to see things through theirs. There is not a lot of juggling involved with the travel part, as my husband is a travel photography enthusiast who, like me believes that by including the children in our travels, we are passing on the greatest gift of all – the gift of gypsy blood and wanderlust. The juggling part comes when I need to write my columns. I try and maintain a travel journal where I jot down notes from the day to day. I shape the notes into columns once we get home and in snatches of time when the kids are otherwise occupied or asleep. Any parting advice to solo travelers? I would advice solo travelers to make eco-friendly choices. Research your destination to find out hotels and homestays that provide sustainable travel choices and those that support local artisans and industries. Try and make the miles that you travel are green ones.